I’ve always been a fan of The Last Unicorn. 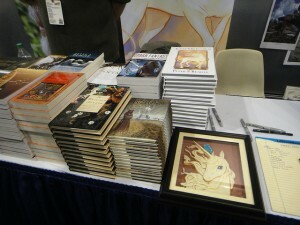 You can imagine my delight when I spotted a booth for Peter S. Beagle while I was wandering around Artist Alley! He was away from his booth when I first stopped by but was told he’d be right back. I talked with his booth buddy (manager maybe?) for a bit and he filled me in on the prices and the different items they had for sale. What caught my eye was a “The Last Unicorn” graphic novel. The images were just amazing. The artists behind it did a truly great job. I couldn’t pass it up and picked a copy and had Mr. Beagle sign it once he returned to his little corner of NYCC. I didn’t have to wait long, as he was back within a few minutes. I explained how I had been a fan since I was little and he seemed to be delighted to hear that. His manager (I’m assuming) noticed my Press Badge and asked some details about that. I explained what When Nerds Attack was about and Mr. Beagle offered some of his own Con advice! What’s his tip? Be sure to always know where the rest rooms are! I couldn’t agree more! The last thing you want to do is waste time trying to figure out where a bathroom is. I actually had that issue while attending NYCC believe it or not. The way the Con was laid out, I had no idea where I was half the time or where a bathroom was. We continued talking a little more and I gave each of them a business card. Who knows, maybe one of them is reading this right now! Did you have any awesome encounters at New York Comic Con this year?